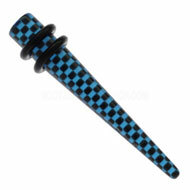 Create a classic skater look with our range of checkerboard stretching jewellery. 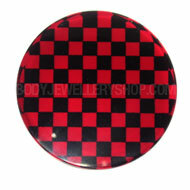 Black and white checkerboard makes for very striking stretching jewellery and is really eye-catching. It draws attention to your stretchings and adds a graphic counterpoint to any outfit. 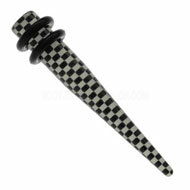 Here at Body Jewellery Shop we have a great choice of checkerboard stretching jewellery including stretching tapers and plugs as well as some checkerboard fake flesh plugs as well. 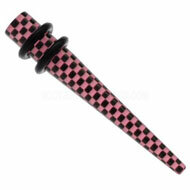 Below are three of our best-selling checkerboard flesh plugs. 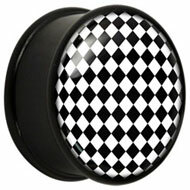 As well as traditional black and white, these plugs come in lots of different colour combinations. 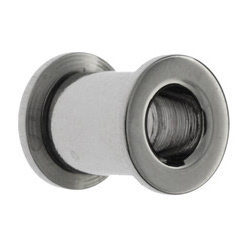 The flesh plug on the left is solid black but most of out checked flesh plugs are made from clear PMMA with the design inside the middle of the plug. The material is UV reactive, so plugs like the red and blue examples glow in UV light – perfect for clubbing! But what if you need to stretch your ears? Well look no further, these checkerboard stretching tapers mean that you can make a statement even while you work up to your desired gauge. These tapers come in 5 different colours and they also glow in UV light. They are made from lightweight PMMA acrylic, which means that they are a smooth, comfortable and cheap way to stretch your ears. Once you get to your preferred gauge you can swap them for plugs or continue to wear them, the choice is yours. This entry was posted in Stretching Jewellery, Uncategorized and tagged Ear Stretching Jewellery, Large Gauge Stretching Jewellery, Stretching Jewellery on June 26, 2012 by Piercing Guru. Refresh your style with some of our incredible body jewellery for sensitive piercings. Our wide range of body jewellery will light up your look and impress all your friends. Choose from our wide range of designs and colours which will instantly pretty up your style. Everyone will love a comfortable body jewellery piece to wear in piercings which get irritated by certain metals. 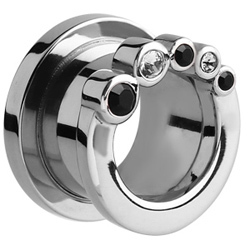 Make sure your piercings feel comfortable all day long with our fantastic value blackline body jewellery. Made from G23 medical grade titanium and black PVD coating, our eye-catching blackline jewellery will stop irritation and will speed up healing. Below we have chosen three of our favourite blackline jewellery which will look fabulous with all your favourite accessories. This beautiful double jewelled navel bananabell will definitely impress all your friends and family with the exceptional quality and stunning clear jewel which will shimmer in the light all day long. 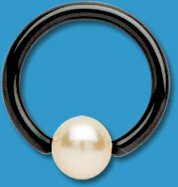 The blackline ball closure ring in the image shown below will look cute in all your piercings. Long-lasting and comfortable, this ball closure ring with a sweet pearl will look adorable with your matching pink makeup. The image on the right shows this plain yet striking barbell which will slip easily through your piercing and will make a fantastic present for a loved friend or sibling. Update your style with our fabulous silicone body jewellery which will light up your look and keep your piercings comfortable. 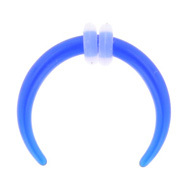 Silicone is extremely flexible and has excellent biocompatibility which will make your jewellery easy to insert. Below we have chosen three of our favourite flesh tunnels which will feel great and look stylish in your piercing. You will love our incredible yellow leopard print and baby blue kaos silicone jewellery which will look great worn to parties, special occasions and days out. 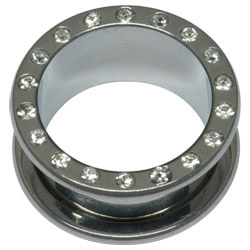 We also have a fantastic pink flesh tunnel edged with clear jewels which will sparkle all day and night long. Get a fantastic value flesh tunnel which you can even wear when you go to sleep and when you’re wearing headphones. Our incredible silicone body jewellery pieces will always provide exceptional comfort and style wherever you go. This entry was posted in Adult Body Jewellery, Ball Closure Rings, Barbells, Blackline Body Jewellery, Silicone Body Jewellery, Stretched Piercings, Stretching Jewellery and tagged Bananabells, Blackline Body Jewellery, Blackline Jewellery, Body Jewellery, Ear Stretching, Ear Stretching Jewellery, Flesh Plug, flesh plugs, silicone flesh tunnels, silicone stretching jewellery, Stretching Jewellery on October 22, 2011 by Piercing Guru. Wooden flesh plugs bring a new dimension to your look and we have recently added nine new products to the online store. Wooden flesh plugs are great for those who have sensitive skin or get irritated by metallic materials. We have a great range of different shapes and designs to choose from so you can easily find something to match your style. Not only do they look awesome but they also reduce odor. Easy to wear and kind to your piercing a wooden flesh plug is a fantastic choice every time. A funky change to traditional round flesh plugs this triangular coconut wood flesh plug has an awesome quality. It has a fabulous natural colour with an eye catching speckled design. The triangle shape gives your piercing a brand new look that is complimentary and exciting. 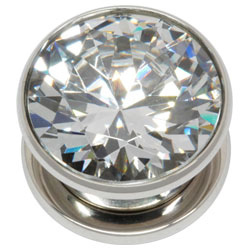 The double flared effect allows it to comfortably sit in your ear. 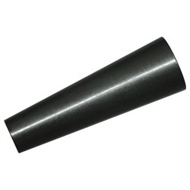 Made from coconut wood this flesh plug comes in a range of gauges from 6mm to 20mm. 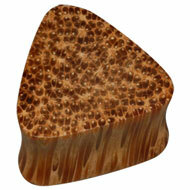 give your stretching a stylish twist with an amazing triangular wooden flesh plug. 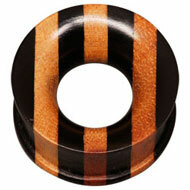 Brighten up your stretchings’ with this stylish iron and rosewood hybrid wood flesh plug. 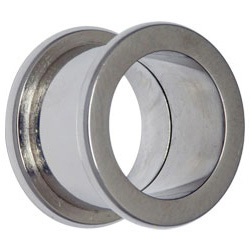 We stock a range of gauges from 8mm to 20mm to suit your particular stretching. 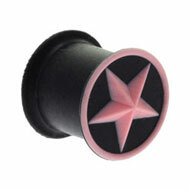 Featuring a small double flare this flesh plug is easy to insert and sits securely in your stretching. Made from strips of ironwood and rosewood you get a lovely contrast of light and dark coloured woods. 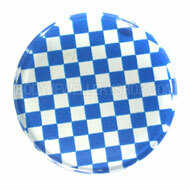 It has a funky polo shape that allows you to see through the middle adding to the eye-catching finish. Enjoy natural style with this wooden flesh plug. This entry was posted in Ear Piercings, Stretched Piercings, Wood Body Jewellery and tagged Ear Stretching, Ear Stretching Jewellery, Flesh Plug, flesh plugs, Wood Stretching Jewellery, wooden flesh plug, wooden jewellery, Wooden Stretching Jewellery on May 26, 2011 by Piercing Guru. 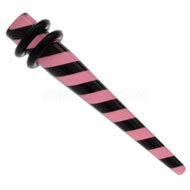 When you are stretching your ears, the last thing you want is to spend a fortune on stretching tools. 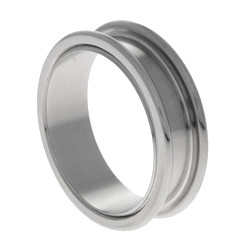 After all, you will probably be switching to other jewellery once you have got to your desired gauge. On the other hand, it is important to get good quality stretching crescents that will be comfortable to stretch will. 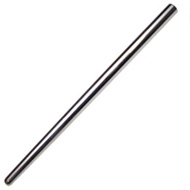 Here at Body Jewellery Shop we have a great choice of high quality cheap stretching crescents. These crescents are easy to stretch with and they start at just £1.50. New this month we have a great range of UV stretching crescents. 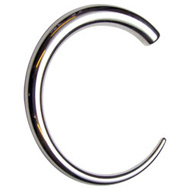 These crescents come in 1.6mm and 2mm, so they are a great way to start stretching up from a standard ear piercing. These crescents are £1.50 and they come in eight different colours. 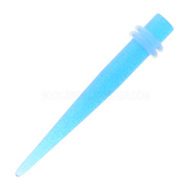 They are very smooth and lightweight, so there is no drag on your piercing. 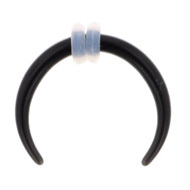 Each one comes with two UV O-rings and they look gorgeous in your piercing. This entry was posted in Acrylic Body Jewellery, Ear Piercings, Stretched Piercings, Stretching Jewellery, UV Body Jewellery and tagged Ear Stretching, Ear Stretching Jewellery, Large Gauge Stretching Jewellery, Stretching, Stretching Jewellery, Stretching Piercings on April 26, 2011 by Piercing Guru.